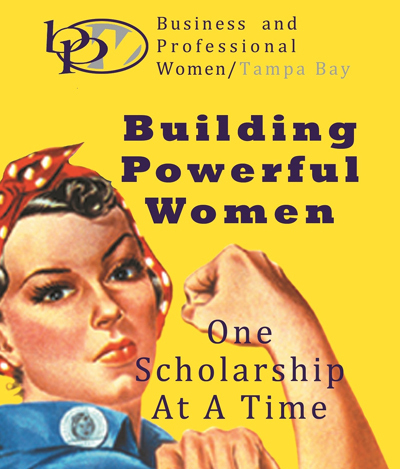 Welcome to Tampa Bay BPW Foundation, Inc.
For over 30 years, Business & Professional Women (BPW) Local Organizations in Tampa Bay have been awarding scholarships to deserving women in our community. Since 1986, we have funded over $138,000 in scholarships to women who have not only proven their scholastic ability but have also made a contribution to our community. We are able to give them a “helping hand” that is not only financial assistance but also our vote of confidence – that we believe in them and their success. We celebrate their accomplishments and make an investment in their future. Our scholarship recipients come from different backgrounds and are in various stages of their lives. Many are young women just starting out – working toward their first career. Some are women who are “re-starting” their career – whether through becoming widowed or divorced or finding it necessary to “re-invent” themselves due to economic factors. No matter where they are in their lives, they share a common desire to succeed and make a better life for their families. Please join us at Tampa Bay BPW ‘s 2017 Networking Night scheduled for January 18, 2017, at the Tampa Club as we endeavor to continue this grand tradition of supporting the women of our community!